Cellulose whiskers resulting from HCl acid hydrolysis of tunicin were subjected to TEMPO-mediated oxidation under various conditions and the extent of the resulting oxidation was characterized by Fourier-transform infrared spectroscopy (FT-IR), conductimetry, X-Ray diffraction analysis and transmission electron microscopy (TEM). With degree of oxidation of up to 0.1 the samples kept their initial morphological integrity and native crystallinity, but at their surface the hydroxymethyl groups were selectively converted to carboxylic groups, thus imparting a negative surface charge to the whiskers. When dispersed in water these oxidized whiskers did not flocculate and their suspensions appeared birefringent when viewed between cross polarizers, thus indicating a liquid crystalline behavior. The authors thank J-L. Putaux for the TEM picture. 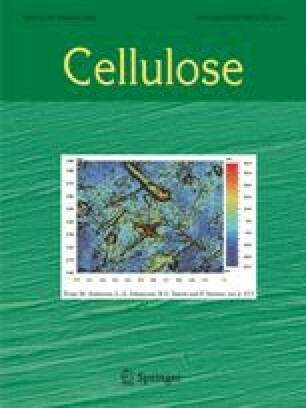 We wish to dedicate this paper to the late Dr.␣Jean-François Revol who has been the main inspirator in the development and use of the suspensions of cellulose whiskers.